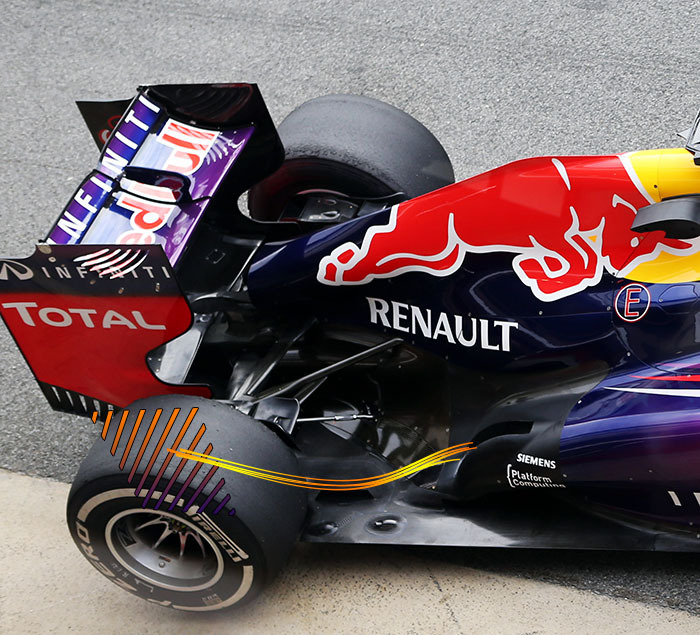 What #F1 cars could lose with new regulations and what we can expect to see? Lorenzo is an Italian F1 fanatic. He regularly posts his findings on the Google Plus community of which he has over five thousand ‘circles’ following him. Often with his ear to the ground for the latest F1 tech rumour, he is also a fan of TJ13 and it’s community and so is eager to write his first article for us. With it he’ll be introducing us to some possible developments we’ll be seeing in the coming weeks from the teams. Over to Lorenzo. The season is about to start, and with it comes many new changes in the regulations, not only will we have new a Power Unit (V6 Turbo charged), but very important aerodynamics changes as well. In the last 4 seasons (5 if we take into account 2009), there has been one team who dominated the field, the Red Bull Racing Team. Thanks to the genius of Adrian Newey, and his maniacal precision for details, the team from Milton Keynes was able to climb the rankings and make the most of every loophole that the regulation gave. During the past year, there have been a lot of discussion about what exactly was the secret that made the Red Bull able to dominate in a manner so overwhelming: diffuser efficiency, T-tray, KERS, traction control, etc … But with new technical regulations, (almost) everything is going to change, let’s take a look at Red Bull to see what cars could lose and how teams are gearing up for the upcoming season. One of the most important changes will be the height of the nose (18.5cm), a change not only with safety purpose, but also aerodynamically: indeed, with a nose so low, it dramatically reduces the airflow beneath it, which used to be then channelled to feed the diffuser. 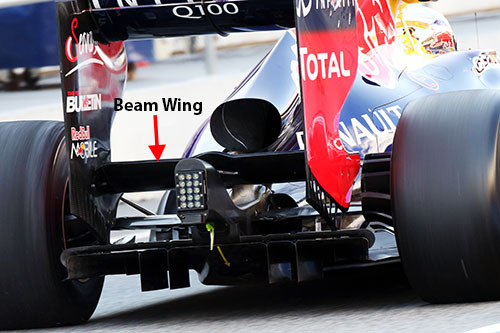 Not only there, but according to new FIA regulations, the beam wing is now banned, which is another thing that will affect diffuser efficiency (as you may know the beam wing, like all the overturned wing creates an area of depression which in the case of the beam wing helped the diffuser in extracting air under the car). But Red Bull dominance was not only due to the huge aero load the car was able to deliver, but also from an intelligent and wise (and alternative) way to use KERS and engine maps (thanks to a very close collaboration between Renault F1 engineers and Milton Keynes) which gave the RB9 a tremendous level of traction at the lower rpm. But what can we expect from the other teams? Let’s start with Ferrari, the prancing horse has aroused much interest around its power unit, due to an innovative distribution of the intake manifolds in order to minimise the overall dimensions of the side pods, moreover, always with the aim to contain the overall dimensions, the new 059/3 will use a heat exchanger air/water/air. 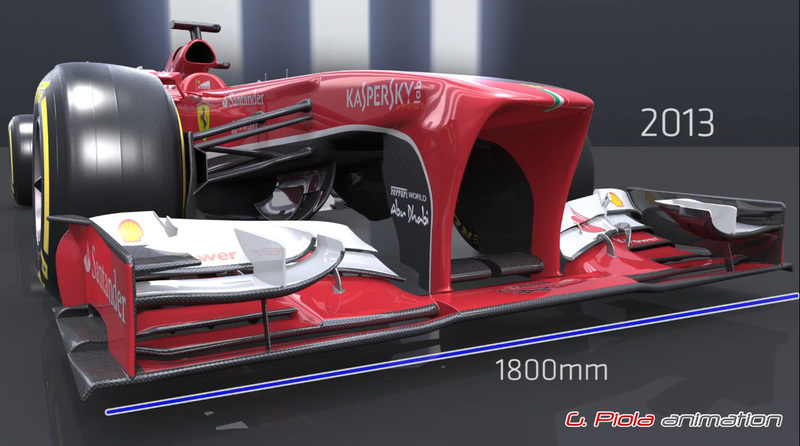 But the rumours around the new Ferrari car are not finished yet. Indeed, during the last months, all of us were sure that Maranello engineers would have dropped the pull-rod layout for the front suspension in favour of a push-rod system. Well now, according to Giorgio Piola, engineers led by Pat Fry, would have chosen to keep working with the “old” pull-rod layout, but why? A pull-rod layout having a lower CG (centre of gravity) could suit the new cars layout better than a push-rod; also, its higher weight could be useful for the balance of the car. Maybe the most interesting rumours concern Mclaren. 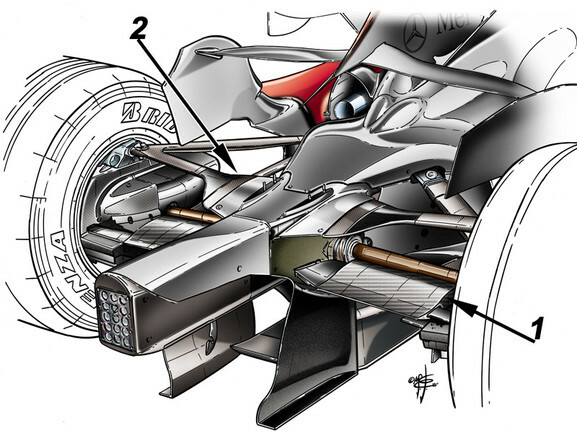 Indeed the Woking team would had dusted off an old solution, used on 2007 MP4/22 car (designed by Newey), this solution consisting in fairing the tie rod and sees the suspension triangle and the convergence rod merged into a single airfoil in order to gain downforce. The trick is that having the tie rod slightly lifted up, the fairing will take the shape of a flap, very useful if you’re trying to repeat the beam wing effect. One of the latest rumours, reports of a brilliant insight from Force India designer Andy Green, indeed it seems that the new VJM07 will have an “hump” on the nose, as it happened on the RB9. According to rumours, it seems that the designer has implemented the hump directly at the top of the chassis, so as to be able to flow more air beneath it to be sent to the diffuser due to a more concave shape. 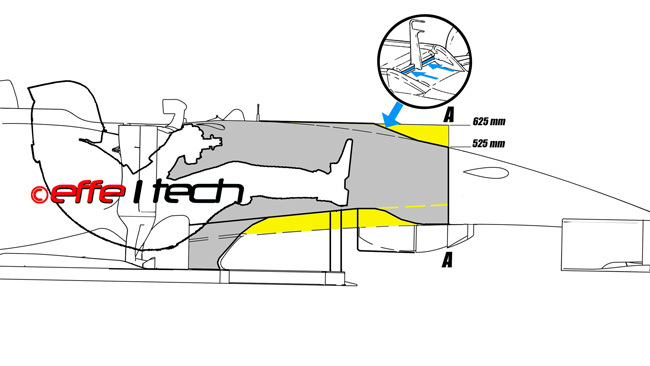 More in general, teams will focus much of their work on the front wing, this is because with new regulations the Front Wing will be narrower than in the past ( 1800 mm to 1650 mm ), this means that the endplate will end just at the edge of the front tyre, resulting in huge differences in the management of airflows, not only on a rectilinear pace, but especially while cornering. The focus, will be trying to direct the airflows outside of the centrifugal effect of the tyre ( the so-called tyre squirt), and let it re-join the inner airflow as soon as possible behind the tyre. For this reason, we should expect an extremely curved endplate. I was wondering if you could clarify something please ? I don’t understand how the intake manifolds which are in the middle of the engine can have ANY effect upon the dimensions of the sidepods ? Do you mean the EXHAUST manifolds ? and the inlets are still in the middle of the engine as I said. And would still have no effect on the sidepods. Sorry for the delay Manky, yes the exhaust manifold, and looking at the pic you posted you could be right. 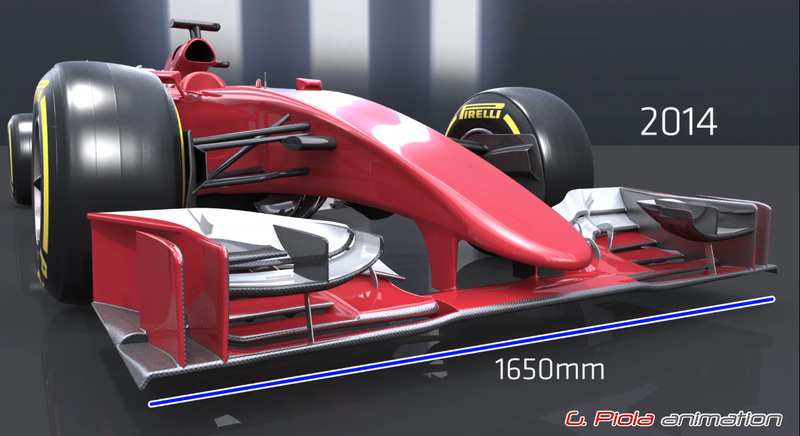 But looking at this pic http://goo.gl/Hgt1Jg of the Ferrari 059/3, you could still notice some differences between the two Power Unit ( assuming that Reanult showed us its real engine ) . From this pic it seems that the manifolds are not in the middle but they go on the sides of the engine, then up to the rear . Nice article – and great graphics. Thanks. Glad to see Lorenzo in the TG13 team. Keep those articles coming!! To what extent do the new regs prevent such a technique this year, when excess torque is a likely issue? I believe the ECU is FIA supplied, which I imagine prevents that sort of thing. Presumably it is programable ? ECU – FIA supplied – as it has been for years. Made by McLaren for the FIA – and programmable by each team. So that won’t prevent anything. Ah, thanks for that. I’d thought that the ECU was being locked down in some way by the FIA to prevent these things, but it seems I was confused. The more you know! One of the things red bull had done was to use the engines retardation mode to extract the traction at low speed and is one of the reasons why Vettel dominated Singapore GP. 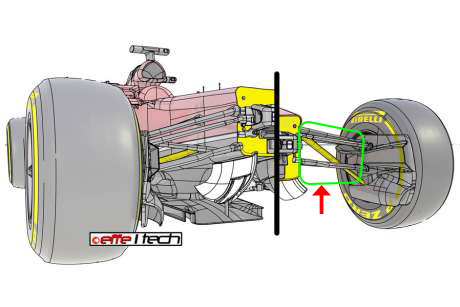 The retardation mode is when the foot is off the loud paddle but thw engine have to be kept running, for instance when entering a corner and mid corner. The Renault engine was programmed to use only 4 cylinders instead of 8 and the cylinders that were active depended on if it was a left or a right corner (turning left: 3 cylinder on right side and one on the left. Turning right: 3 cylinders on the left and one on the right). In retardation mode the engines have less restrictions on how much fuel is and air is left through for cooling purposes. Great article Lorenzo, I love the tech stuff most of all, that’s why I wil never fall out of love with F1, because I don’t really care who wins, it’s a by product of the very best team, with the best inovations. The war between the rule makers and the rule breakers will never stop and each continues to become more advanced pushing the other to think even harder. I don’t think.the drivers role has been degraded too much as they are still a % carrying part of the package. I think it’s the stlye of racing that we are going through at the moment, doesn’t allow the drivers to give full attack for 100% of the race length. I know there has always been an aspect of drivers having to manage their resources during a race, but I really believe the great reliability we have witnessed over recent seasons is in a large part down to the cars not being pushed as hard as they are capable and build to be in part down to the tyres but also the way the FIA is constantly trying to slow the cars down. I hope this season with the reduced downforce and greater torque levels we will see drivers earning their money when fighting with these new beasts. +1 Totally agree with you CV! 1: Does anyone know which way McLaren are going – push or pull rod? 2: I hear BBC are looking for a new technical analyst …..